10 Healthy Diet Swaps you NEED to do! I was quoted in Women & Home Magazine (April 2013) talking about how to eat healthier through simple rules, tweaks and swaps that will boost your health quickly, easily and without a total life overhaul! 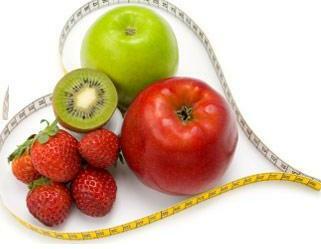 So read on to see if any of these healthy tips can help with your diet! Mix up your Mash. Try mashing cauliflower, swede, butternut squash, sweet potato or carrot (or a mix of the two), instead of your usual potato. Carrot and swede tastes delicious together and it counts towards your 5 a day too. Sweet potato releases its energy much more slowly than an old potato, meaning it will keeping you fuller longer! Check out my Healthy Shepherds Pie recipe for inspiration! Cut down on Oil. Invest in a non-stick frying pan and use no more than 1 teaspoon of oil (50 Kcal!) per person per meal. You can keep the calories in check even more with 1 calorie spray oil. For cooking, I suggest using vegetable/rapeseed oil for heart health. There’s lots of new and exciting research about the benefits about cooking with coconut oil too, so great if you like the taste of it! Cut Baking Fat in Half. Experiment by replacing half the butter in sweet recipes with mashed banana, pureed apple or pear (check out the baby food aisle for 100% fruit if you want to save time!) or even yoghurt. I use mashed banana in my banana protein bars and 3 ingredient protein cookies, apple puree in my pumpkin muffins and yoghurt in my healthy banana bread recipe!. Throw in Extra Veggies. By adding finely chopped veg to soup, stews and sauces you can double your daily vegetable intake, which means more vitamins, minerals, antioxidants and fibre! I love adding extra veggies to my skinny pizza! Like Smoothies? Blend in a handful of vegetables to up the nutrient content, but make sure to stick to the same colour family. So, if you’re making an apple and lime smoothie, green veg such as kale will work. Add a grated carrot to orange or peach-based smoothies. Check out my green monster smoothie for a super taste recipe (with spinach!). Eat Canned Salmon instead of Tuna. 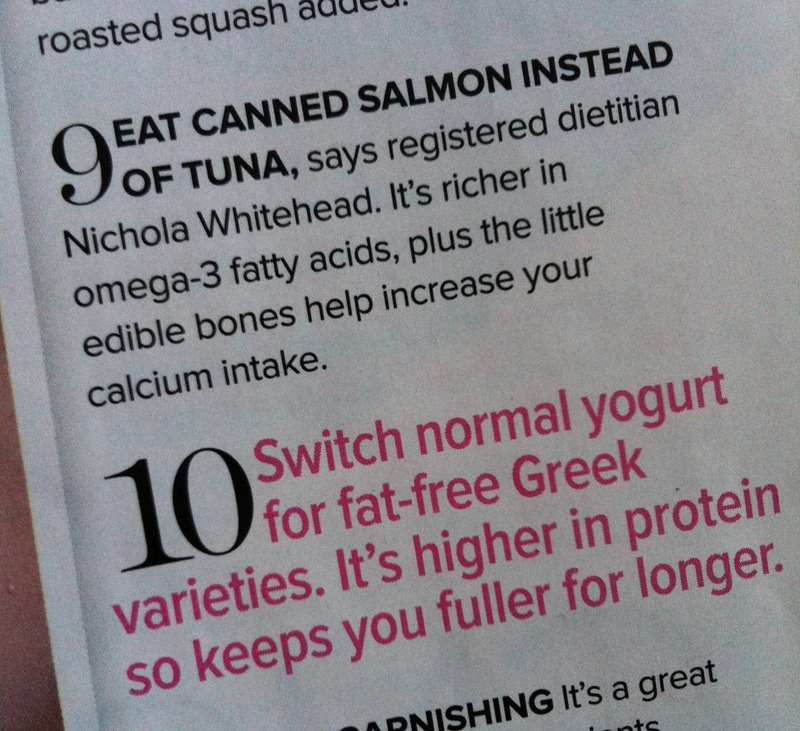 Canned salmon is richer in omega-3 fatty acids, plus the little edible bones help to increase your calcium intake. You should aim to eat 2 portions of fish a week, 1 of which is oily e.g. salmon, mackerel, pilchards, sardines (or if you have diabetes aim for 2 portions of oily fish a week). Check out my salmon fish cakes for a tasty supper recipe! Switch to Greek Yoghurt. Greek yoghurt is higher in protein so keeps you fuller longer. Make sure to choose the fat-free varieties if you’re watching your weight though! Check out my how to choose a healthy yoghurt blog for more information, or my Total Greek Pancake Stack recipe for a yummy breakfast idea! Get Garnishing Savvy. Swap salt, which can cause bloating, for fresh herbs such as parsley and chives, and spices such as paprika and black pepper. You don’t need to add calories to add flavour! Swap Couscous for Quinoa. Quinoa is a source of complete protein (it contains all the essential amino acids) and because it has a lower GI than couscous it will keep you feeling fuller for longer (a low GI means food releases the energy slowly). I’ve used quinoa in my Harissa Roasted Salad Recipe & my Pumpkin Bar Recipe! Revisit your Veg Enemies. Boiled vegetables can taste bland, so instead try roasting your veggies in balsamic vinegar or cumin and paprika. Kale tastes delicious when baked with nutmeg (kale crisps!) and grilled beef tomatoes taste super rich and juicy. Broccoli or Brussels sprouts taste delicious lightly fried with flaked almonds too! I hope these tips inspire you to make some healthy swaps to your own diet! P.S If you liked this post then check out my ‘simple swaps’ and ‘healthy snacks’ blog post for more inspiration!